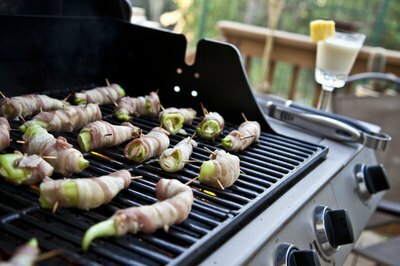 Porcelain and stainless steel are two of the most common materials used in construction of backyard grills. Both offer surfaces that hold up well to harsh weather elements and heat, and both have positives and shortcomings. Shopping around, comparing prices and considering the type of barbecuing that best suits one's needs all are important strategies to selecting a backyard grill. Nearly all grill types incorporating the stainless steel structure are gas- or propane-fueled. Stainless steel resists rust and other types of corrosion that can result from harsh weather conditions. And the gas burners inside offer a quick grilling option without the messy cleanup of ash and char inherent in most charcoal-fueled grills. Several grill manufacturers, including the iconic grill company Weber, incorporate porcelain coating on charcoal and gas grills alike. The classic kettle-style charcoal grill contains a porcelain enamel coating both inside and outside the grilling chamber that protects the core steel skeleton against rust and heat damage. Porcelain also is a good insulator, helping the grill retain more heat than standard steel structures. 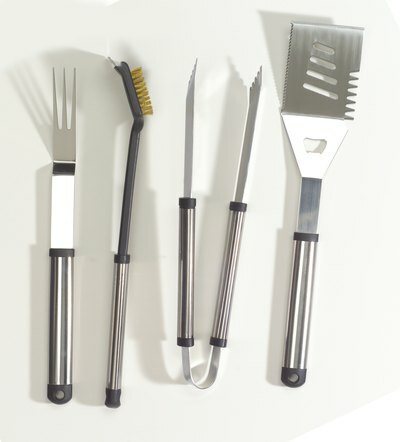 Most porcelain and stainless steel grills afford both direct and indirect grilling techniques. 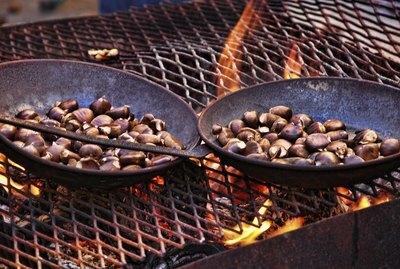 The majority of stainless steel or porcelain-coated gas grills on the market have two or more burners. 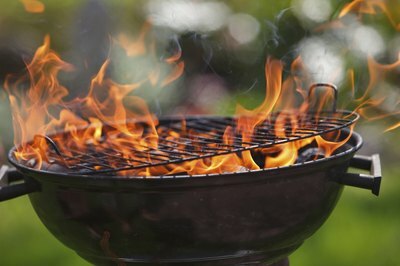 For direct grilling, a style involving cooking food directly above the flames, grill users ignite all gas burners and place the meat directly above the heat source. Direct grilling in porcelain-coated charcoal grills means covering the entire coal grate with a layer of lit coals and grilling food directly above the hot coals. Indirect grilling in porcelain or stainless steel gas grills entails lighting one burner (in two-burner grills) or lighting the two outside burners (in three-burner grills) and placing the food directly above the unlit burner. This is a slower cooking process that requires the heat to bounce off the inside of the grilling chamber before contacting meat, poultry or fish. 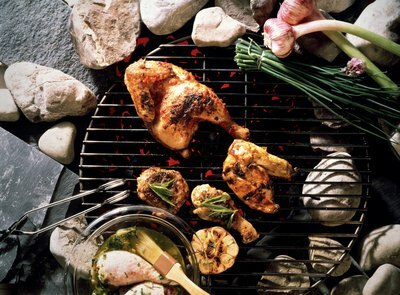 Indirect grilling in porcelain-coated charcoal grills means building two small coal fires on either side of the coal grate, placing a drip pan in the center of the coal grate and then placing the food on the cooking grate directly above the drip pan. The exterior of stainless steel grills can be cleaned with soft cotton-based rags and warm water. Abrasive scrubbers or cleaning solutions can scratch the exterior and lead to corrosion damage. Special stainless steel cleaners and application pads and mitts also are available. Porcelain-coated grill exteriors can be cleaned with soft rags or sponges and warm water with a light amount of dish soap. A simple wiping with a dry or slightly damp rag at the end of the grilling season is all the interiors of porcelain-coated grills require. In addition to the grill bodies, cooking grates often are constructed of either stainless or nickel-plated steel or of steel coated with porcelain enamel. 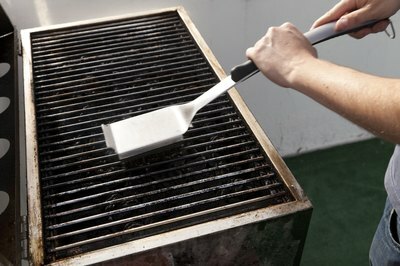 Stainless steel grates benefit from frequent lubrication with vegetable oil grilling spray and regular cleanings with stiff wire grill brushes, according to grillmaster Steven Raichlen, a renowned barbecue author and proprietor of the website www.barbecuebible.com. Porcelain-coated grates require a light soapy wipedown with a soft rag following use. Wire brushes can scratch and corrode the enamel coating. Regardless of the type of grill, heat-resistant grilling mitts and long-handled tongs and spatulas should be used during the cooking process and removing hot lids or adding coals. Both stainless steel and porcelain-coated steel heat to extremely high temperatures during the grilling process and retain this heat long after the flames cease.